ATN NVBNB05X20 NVB5X-2 Night Vision Binocular FREE SHIPPING! The NVB5x-2 Night Vision Binoculars from ATN are a resilient nighttime, daytime, anytime choice ideal for surveillance and tactical mission work. 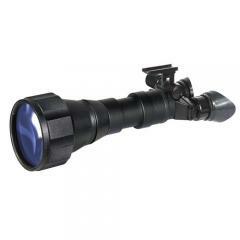 Multi-coated glass lenses and a powerful, internal image intensifier utilize minimal amounts of environmental light to deliver a clear and visible sight picture regardless of field conditions. When working in zero-light environments, the binocular uses a built-in infrared illuminator to create the light needed for total vision clarity. A ruggedized exterior is built for harsh field use and features a hardened aluminum exterior for exceptional resistance to impacts without the weight of steel. Premium quality O-ring seals and a nitrogen-purged body add to the NBB 5x-2's tactical functionality by providing the fog and weather-resistant operation needed to handle any climate or weather condition. ©2002-2019 CopsPlus.com: ATN NVBNB05X20 NVB5X-2 Night Vision Binocular FREE SHIPPING!